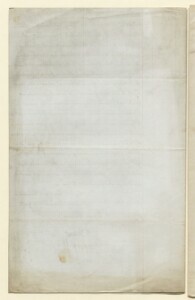 The record is made up of 1 file, 21 items (73 folios). It was created in 3 Dec 1864-8 Jul 1872. It was written in English. 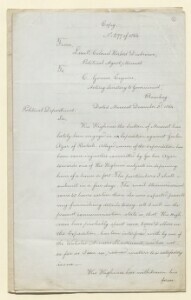 The original is part of the British Library: India Office The department of the British Government to which the Government of India reported between 1858 and 1947. The successor to the Court of Directors. Records and Private Papers. 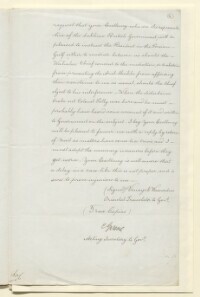 Copies of official correspondence to and from Lewis Pelly, Political Resident A senior ranking political representative (equivalent to a Consul General) from the diplomatic corps of the Government of India or one of its subordinate provincial governments, in charge of a Political Residency. in the Persian Gulf Historically used by the British to refer to the sea area between the Arabian Peninsula and Iran. Often referred to as The Gulf or the Arabian Gulf. ; Charles Gonne, Secretary to the Government of Bombay; the Political Agent A mid-ranking political representative (equivalent to a Consul) from the diplomatic corps of the Government of India or one of its subordinate provincial governments, in charge of a Political Agency. at Muscat (Colonel Herbert Disbrowe, Captain George Andrew Atkinson) and the Secretaries to the Government of India (Charles Girdlestone, William Muir). 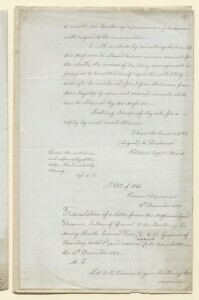 There is also enclosed correspondence on behalf of the Secretary of State for India (Sir Stafford Northcote, The Duke of Argyll, The Marquess of Salisbury, and the Viscount Cranbrook) and the Secretary of State for Foreign Affairs (the Earl of Clarendon). 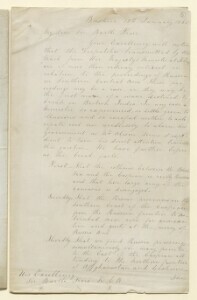 The situation in Muscat including the dispute between the Sultan of Muscat and the Wahabees [Wahhabi]; threats to the Sultanship from Ibrahim bin Qais and Azzan bin Qais; and the attempts by Sayyid Turki bin Said al-Said to overthrow his nephew Sayyid Salim II bin Thuwaini al-Said. 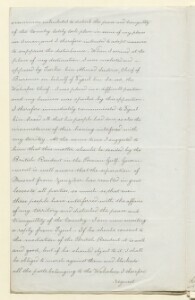 The resolution of affairs in relation to Bahrein [Bahrain], Guttur [Qatar] and Aboothabee [Abu Dhabi] following acts of plunder and aggression undertaken by members of their tribes against Persian and Arabian towns and villages. 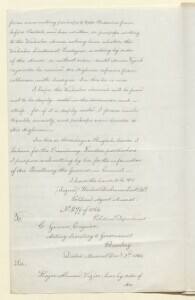 The correspondence refers to Bahrein and Aboothabee's reaffirmation of their commitment to the maritime peace treaty and the signing of the treaty by Mahommed ben Sanee [Muhammad bin Thānī] of Guttur, as well as decisions in regard to the sanctions against Mohammed ben Khalifah [Shaikh Muḥammed bin Khalīfah Āl Khalīfah], the orchestrator of the acts of aggression. Questions regarding the sovereignty of Bahrein and Guttur. 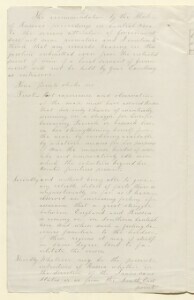 The correspondence includes details of both Persia and Turkey's claims to the sovereignty of Bahrein and includes translations of letters from Mahommed ben Khalifah [Shaikh Muḥammed bin Khalīfah Āl Khalīfah] in which he recognises Persia's sovereignty of Bahrein and its peoples and concerns over Turkish claims of sovereignty following the death of a Turkish General on the mainland near Bahrein. 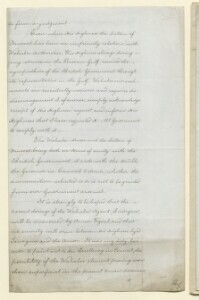 The question of the sovereignty of Guttur relates to its recognition by Lewis Pelly in 1868 in signing the maritime peace treaty and arrangements made by Pelly for the tribute paid by Guttur to Bahrein to be paid through the Political Residency A diplomatic office of the British Government established in the provinces and regions considered part of, or under the influence of, British India. , which the British Government viewed as simply an arrangement to pay tribute to protect both states frontiers against the Naim [Āl Na‘īm] and Wahabee [Wahhabi] tribes, rather than a statement of Guttur's independence. 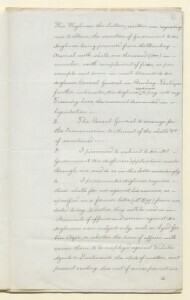 The contents of the file have been arranged chronologically according to date, with enclosures to letters being placed directly after the letter they are enclosed with. Foliation: The contents of the file have been foliated using a pencil number enclosed in a circle located in the top right hand corner of the recto The front of a sheet of paper or leaf, often abbreviated to 'r'. of each folio.